Editor’s note: To better prepare you for the upcoming Cooper-Young Regional Beer Festival, here’s a guest post from festival organizer Toby Sells. Enjoy! 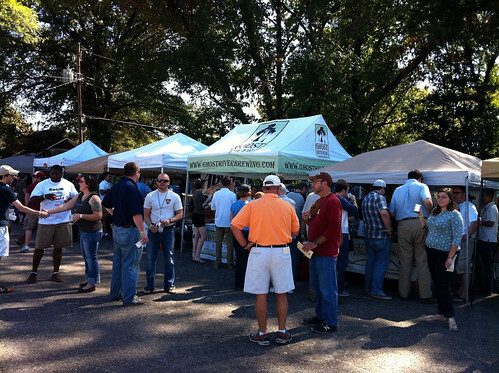 Beers will flow generously again this year at the Cooper Young Regional Beer Festival, a fund raiser for the “historically hip” Memphis neighborhood. Inside: At the gate, you’ll get a 12-ounce plastic beer mug that you’ll use to sample beers. You’ll likely get a 10-ounce pour for every beer you try (that’s a chug, not a taste). Buckets will be available so you can pour out any beer you don’t like and there will be water to rinse your cup out. Beers: There’s no Bud Light here. We’ll only have craft beers from independent brewers and brewpubs (think Ghost River and Boscos). They’ll bring their best sellers and probably some experimental stuff, too. Educate yourself: Our Beer Tent Revival is back. If you’re a beer fan, this is your Woodstock. Our brewers are lined up to speak all day about their beer and take your questions. Food: Local restaurants Stone Soup Cafe and Sweetgrass (and maybe more) will bring their goods this year so bring some cash to get some eats. Tickets: Tickets are $35 in advance and $40 at the gate. The number of tickets available is based on how much beer our brewers bring so everyone has plenty to drink and there are no long lines. Total tickets are capped and we could run out. Get them while you can. Other stuff: Feel free to bring a camp chair. We’ll have some tents for shade, but bring an umbrella if you think you’ll need more. Please leave your pets and kids at home, though (no one under 21 is allowed in the festival). Also, bring cash for food, shirts and other cool stuff. The guys from Goner will spin records so bring your dancin’ shoes. About the author: Toby Sells is a Cooper-Young resident, beer fest organizer and all-around classy gentleman.